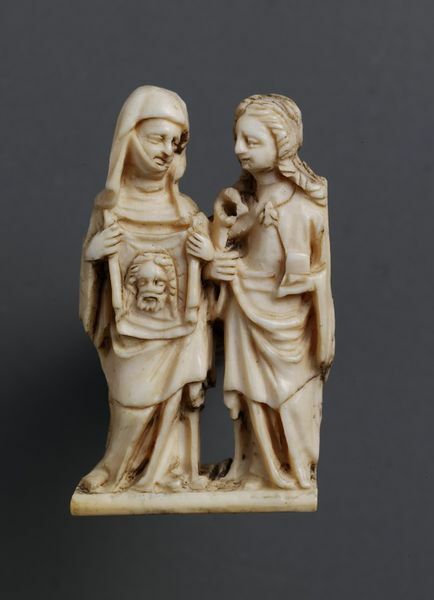 This miniature ivory group depicting St. Veronica and St. Apollonia was possibly made in Lower Rhine or in France (Paris), in the late fourteenth century. This group is particularly interesting because of the rarity of groups on such a small scale. Another ivory group, similar in style, of St. George and the Princess Saba is now the property of Mrs. Gilbertson, and was exhibited at the Burlington Fine Arts Club in 1923 (Catalogue no. 92). This miniature relief may originally have been set in a small diptych pendant or locket. 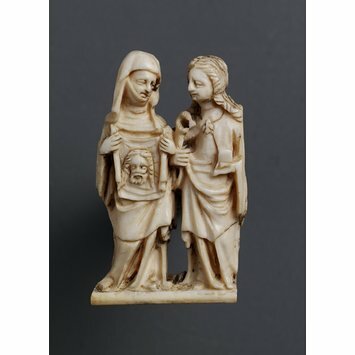 This miniature ivory reliefs should be viewed in the same light as their Kleinplastik counterparts in precious metals and enamel. The later examples, dating from the second half of the fifteenth to the early sixteenth century, are also often comparable to works in other materials, such as the more numerous mother-of-pearl roundels. Both drew on the same graphic sources and brought sacred images into the possession of the pious. Group in ivory. St. Veronica, her head covered in a veil and wimple, carries the Sudarium with both hands, and St. Apollonia holds a pair of pincers, the symbol of her torture, in her right hand and a book in her left. Formerly in the Trapnell Collection (Sale, Christie's, March 18th, 1914, lot 240). Bequeathed by Henry L. Florence, Bath, in 1916. Ik, Maria van Gelre. De hertogin en haar uitzonderlijke gebedenboek (1380-1429), ed. by Johan Oostermann. Nijmegen / Zwolle: Museum Het Valkhof / Waanders Uitgevers, 2018. ISBN 9789462622012. Catalogue of the exhibition held at Museum Het Valkhof Nijmegen, 13 October 2018 - 6 January 2019.